In June 2011, when I was in Kalimantan, it was the dry season and the Rungan River was extremely low. A few of us had planned to take a trip up-river on the Rahai'i Pangun river boat belonging to Lorna Dowson-Collins and Gaye Thavisin, but the water was too shallow. Instead, they arranged a smaller boat for us – it turned out to be the river ambulance. Within a short while after leaving Tangkiling, we came across of group of Orangutans eating a hearty breakfast of bananas and pineapples. The amusing thing was the little grey monkeys who were continually darting in, trying to get at the fruit. 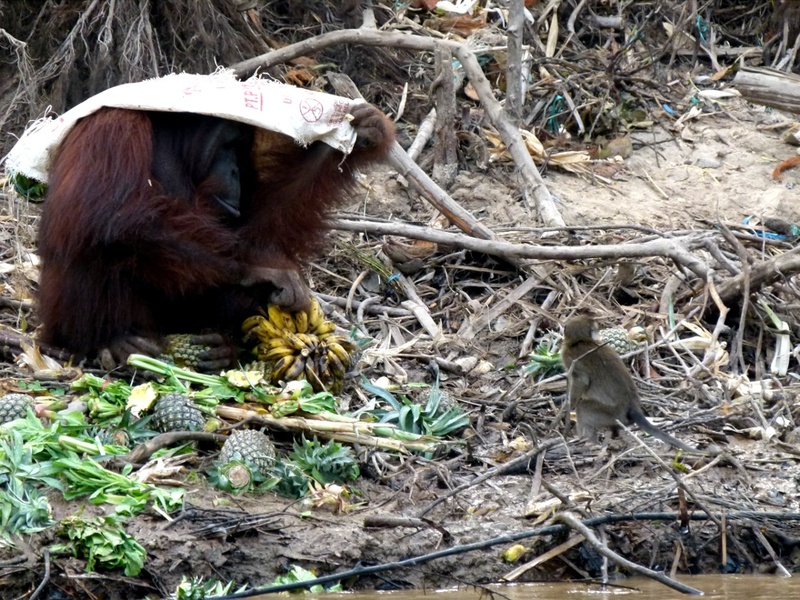 Then this older male took the bag that the fruit had obviously been brought to the island in, and covered his head. These Orangutans are part of the rehabilitation project, and are put on these islands as a first step once they're old enough; even so, the islands do not produce enough food for the animals, so they are also fed. Eventually, it's hoped they'll be able to survive in the wild. We couldn't figure out what he was up to, but then he peeked out from underneath it, when the little monkeys sneaked in. It was as though he was happy to have them join in the feast, and that by covering his head he thought they might not realize he was there! The picture was taken with a Leica V-Lux 2, digital camera.